Tiger Woods wasn’t the only big winner on Masters Sunday. One bettor successfully turned a $85,000 wager on Tiger to win the 2019 Masters into a $1,190,000 payout. UPDATE APRIL 15: The bettor who won $1.19 million after betting $85,000 on Tiger Woods to win the 2019 Masters was identified today. He is 39-year-old James Adducci from Wisconsin. Adducci placed the bet on Tiger to win at 14/1 (+1400) odds at the William Hill Sports Book at SLS Las Vegas on April 9. 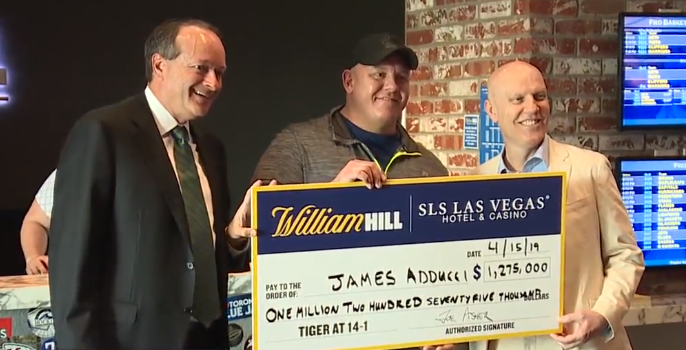 To celebrate the win, Joe Asher, CEO of William Hill US, and Paul Hobson, General Manager of SLS, presented Mr. Adducci with a check for $1,275,000 (inclusive of the 1,190,00 payout plus the original 85,000 stake) at the William Hill Sports Book at SLS Casino on Monday. James Adducci flew to Vegas on the morning of April 9 to make the wager on Tiger, his first sports bet ever, before flying right back home. LAS VEGAS (KTNV) -- Tiger Woods wasn’t the only big winner on Masters Sunday. One bettor successfully turned a $85,000 wager on Tiger to win the 2019 Masters into a $1,190,000 payout. The bet on Tiger to win the 2019 Masters Tournament was placed on April 9 at 14/1 (+1400) odds, at one of William Hill’s Las Vegas Sports Books. The win represents the largest golf payout in William Hill history. Back on August 13, 2018, Tiger opened as a co-favorite at 12/1 (+1200) odds (along with Jordan Spieth, Dustin Johnson, Justin Thomas, Tiger Woods, Brooks Koepka, and Rory McIlroy) to win the tournament. Before Sunday’s final round started, Tiger was available at 3/1 (+300) to capture his fifth Green Jacket.